Winter Storms in North Carolina are the best. The whole state shuts down and people actively celebrate the inability to get out of driveways or do much of anything. Schools are cancelled if there are whispers of a wintry mix and our Governors declare a state of emergency if it threatens to snow. Venturing out onto icy roads in a motorized vehicle can trigger community shame, whereas neighborhood kids take to the slushy streets with makeshift sleds if even an inch hits the ground. Last week a local meteorologist said there was a "high probability that Wednesday would happen." Now, what this veteran weatherman intended to say was that the snow forecasted for Wednesday would happen, but after more than 25 years in the Southeast, I prefer to believe he meant that, despite the snow in the forecast, there was still a high probability the world would not end and that the day Wednesday would, in fact, still happen. I know, Snow (and snow days) can create a panic. Need proof? Look at any bread shelf just an hour after the forecast for snow. I wish I could remember where I first heard this fun nugget, but with the amount of eggs, milk and bread purchased before a snow day it's like winter weather in the forecast triggers a primal human need... to make french toast. I did not freak out and make french toast. I paused. I reminded myself that the snow and ice would melt soon and had the best week ever (read: snow week, one snow day which quickly turns into three days out of school). I had the best week because the dude you see above was full of joy, excited to play, and we had a blast. I am grateful to my zen Zach Ward, Jr. for helping me to put everything in perspective. Always. Snowball fights, check. Snow angels, check. Sledding, check. Build snow ramps at base of the hill that inadvertently stop the sled, launching boy into the air, check. Check that boy survived, check. The snow covered everything over and we just got to play and explore a world that was fresh. We saw our breath. We fell into snow banks, backwards and forwards. This storm was the best. The snow was powdery, but perfect for snowballs and sledding. We came inside to warm up and drank hot chocolate, which Zach described as tasting marshmallow-y even though there were no marshmallows "anywhere near us right now" (because it was made with whole milk). We let our shoes dry out and we did it all over again. 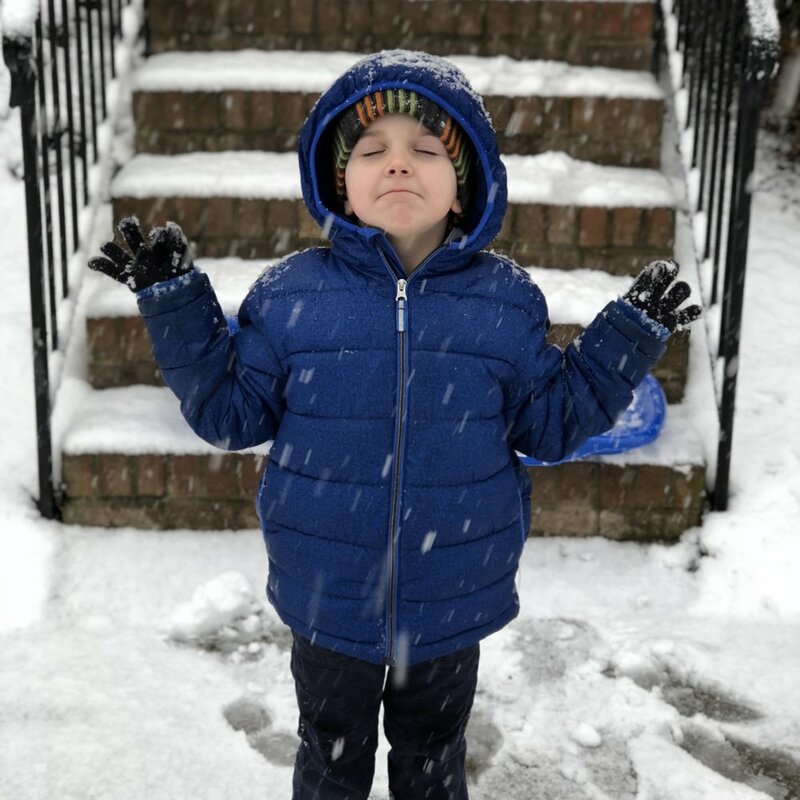 I've decided to challenge myself for 2018, to remind myself to experience the joy and the sense of wonder my son had for our snow days together in every aspect of my life. What if we could all stop the irrational french toast panic? What if we could treat life as if it had the potential to be marshmallow-y (even in the absence of marshmallows)? Snow Day pics on Instagram.